OnePlus is a smartphone brand that develops devices that has amazing specs at a very reasonable price tag, however, their products are not readily, or shall I say, officially available in the Philippines. 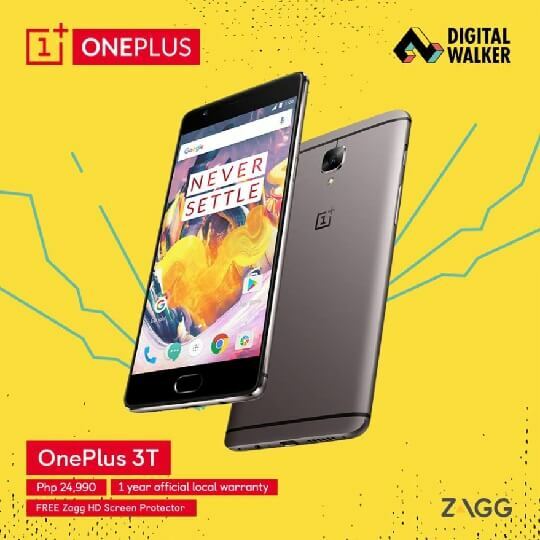 Thankfully, Digital Walker is finally bringing it in the country, at least their latest product, the OnePlus 3T. The OnePlus 3T is dubbed as the "flagship killer" mainly because of high-end specs with a price tag that cost far less than other flagship offerings. To give further perspective, it will only retail for Php24,990 when it lands here on March 25, far more affordable than the Php34,990 landing price tag of Samsung Galaxy S7. That is not all, every purchase also comes with free ZAGG screen protector. But wait, there is more! If you buy it on a cash basis, you will also get additional Php1000 discount. In terms of what it has to offer, it sports a 5.5-inch Optic AMOLED display with Full HD resolution, thin bezel of 0.755mm and covered by Corning Gorilla Glass 4 for added protection. On the inside, it is powered by Qualcomm Snapdragon 821, a top of the line chipset from 2016, paired with huge 6GB of RAM and 64GB of ROM. It also has 16MP main camera with 4K video recording capability, 16MP front camera, dual SIM slot with Cat. 6 LTE connectivity, 3,400mAh battery with Dash Charging support, and runs on OxygenOS based on Android Nougat.